OpenShot Video Editor | Free, Open, and Award-Winning Video Editor for Linux, Mac, and Windows! Get started making beautiful videos today! OpenShot is incredibly amazingly wonderfully fantastically simple and powerful! We designed OpenShot Video Editor to be an easy to use, quick to learn, and surprisingly powerful video editor. Take a quick look at some of our most popular features and capabilities. 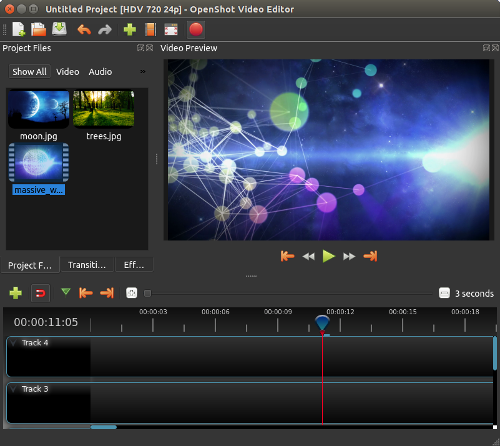 OpenShot is a cross-platform video editor, with support for Linux, Mac, and Windows. Get started and download our installer today. Quickly trim down your videos, and find those perfect moments. OpenShot has many easy ways to cut your video. Using our powerful animation framework, you can fade, slide, bounce, and animate anything in your video project. Add as many layers as you need for watermarks, background videos, audio tracks, and more. Using our video effects engine, remove the background from your video, invert the colors, adjust brightness, and more. Visualize your audio files as waveforms, and even output the waveforms as part of your video. Adding titles to your video has never been easier. Use one of our templates, or make your own. Render beautiful 3D animated titles and effects, such as snow, lens flares, or flying text. Control the power of time, reversing, slowing down, and speeding up video. Use a preset or animate the playback speed and direction. Drag and drop video, audio, or images from your file manager into OpenShot. It's that easy to get started video editing. OpenShot is available in many different languages, and can be translated online with LaunchPad. We have designed OpenShot to be the easiest and friendliest video editing software ever! Give it a try and see for yourself.